Hi there! Thanks for stopping by today – I have a card to share with you that I made to play along with the new Watercooler Wednesday Challenge – WWC53- Heidi’s Sketch Challenge. I started with a square of Whisper White cardstock, and stamped the flower image in Versamark ink, covered it with Gold Embossing Powder, then heat embossed it. I then used my Blender Pens and Melon Mambo ink pad to colour in the flowers, and Pear Pizzazz to colour the leaves. I then stamped the 2 dragonflies in each corner in Basic Gray Archival ink, then added some Tempting Turquoise to the wings using my Stampin’ Write marker, then I used the Gold Wink of Stella Glitter Pen to add some gold to the wings and body of the dragonflies. I took this picture at a bit of an angle, so you could see the embossing and the gold glitter. I just love how easy it is to add a touch of gold, right where you want it, with the Wink of Stella pen! Next I used a Sponge Dauber and the Tempting Turquoise ink to add some colour to the background. I then cut the stamped panel (while holding my breath!) into 4 equal squares, and mounted them onto squares of Basic Gray cardstock. The sentiment is from the Best Thoughts Hostess set, also in the Annual Catalogue (pg. 180), stamped in Tempting Turquoise ink onto Whisper White. I sponged the edges with the Tempting Turquoise Sponge Dauber, then mounted it onto a square of Basic Gray as well. 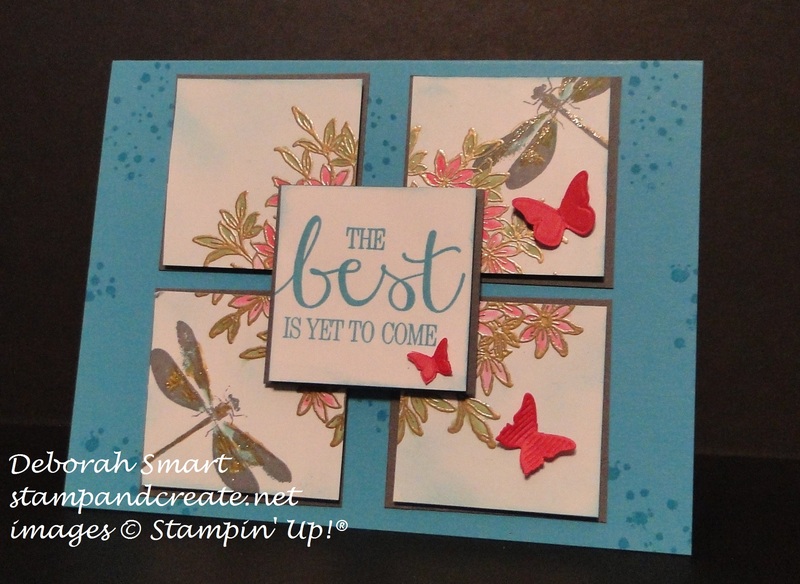 I stamped my Tempting Turquoise card base with the splatter from the Awesomely Artistic set in Tempting Turquoise ink, then mounted all of the squares on top, as per the sketch. I then used my retired Butterfly Sizzlets to die cut the butterflies from Melon Mambo cardstock, and glued them onto the card from using Tombow glue. I hope you like my card as much as I do – or even a little! I’d love to read a comment from you, if you have time to leave one. Then, I hope you’ll head over to the Watercooler Challenge page, and see the other cards – and join in yourself! Next Next post: Gung Hei Fat Choi! Happy Lunar New Year! Third time lucky? I keep trying to leave a comment, Deb. Beautiful card, Deb. I love what you’ve done with the sketch. Using the Awesomely Artistic for your background on those four squares is brilliant. Great colour choices, too. Thanks so much for joining us this week for the Watercooler Wednesday Challenge. Deb your cards are always so beautful!. I love the design and the colours.